Spending the summer in Greece is an excellent idea, but don’t be too quick to dismiss it for your winter holiday break. You may be surprised to find out that temperatures can reach as high as 18 degrees Celsius (64 degrees Fahrenheit) in November and December in the southern parts. If that hasn’t convinced you yet, here are ten reasons why you should head to Greece during winter. Mythology has it that Mount Pelion was the home of Centaurs, who taught ancient Greek heroes the arts, and once you’ve visited the area, you may agree that there is something mythical about it. Home to 24 picturesque villages, Mount Pelion is a perfect combination of cascading waterfalls, vibrant greenery, and spectacular nature. Stay in a traditional mansion to add a touch of authenticity to your trip, and make sure to bring warm winter clothes with you. Take advantage of the opportunity to try new things. Forget the classic ‘Greek salad’ and opt for the winter variants. As Greeks eat seasonally, you will get to discover winter recipes, such as stuffed cabbage rolls (lahanodolmades), wild greens (horta), or bean soup (fasolada). For dessert, you’re in luck as Christmas is the season of baking in this Mediterranean country. Kourakiedes, diples, and melomakarona are scrumptious sweets that will make you fall in love with winter in Greece. Although winters in Greece tend to be mild, you’ll still want something to stay warm, and having a rakomelo, a drink that is consumed year-round but more often during the colder months, is an ideal option. A blend of raki and honey, this herb-infused spirit is one of the best options to warm up during the cold nights. If raki is not your thing, however, there is also a version of this drink made with wine, called oinomelo. Athens is hands down an all-year destination. With its plethora of museums, ancient landmarks, bars, and restaurants, the city is an easy pick. But why not give Greece’s second city a try? Thessaloniki is equally filled with archaeological sites, an excellent food scene, and lively nightlife. Or what about seaside town Kavala? It’s situated on the slopes of Mt. Symvolo. Spread out around scenic Lake Pamvotida, Epirus’ capital Ioannina (also called Yannena) is another locale. Drama, in northeastern Greece, is home to one of the most famous Santa Claus villages in the country, Oneiroupoli. With a strong Christmas spirit, the theme park, covering over 20,000 square meters in the Municipal Gardens of Drama, offers a variety of activities for children and parents. Visitors can explore the small wooden houses, take a ride on small trains, enjoy free activities for children or taste Christmas beverages and dishes. 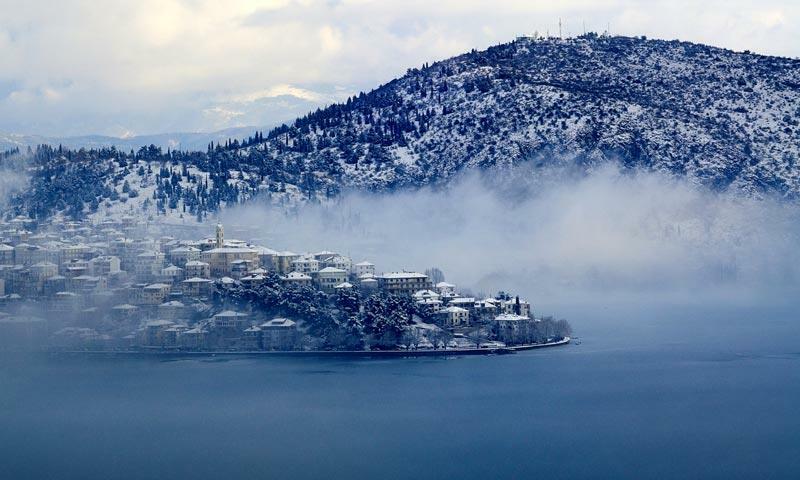 But apart from Oneiroupoli, you can also visit the city of Drama and take a day trip to the nearby ski resort, Falakros. Oneiroupoli, the city of dreams. The advantage of visiting Greece in the winter is the chance to admire its ancient landmarks without a lot of people around. With the throngs of tourists long gone, the mainland sites are practically deserted, which allows you to explore and experience the sites thoroughly. Picture this: a beautiful shot of the Parthenon with a moody sky and sun rays piercing through the clouds. And no tourists. Now, isn’t that marvelous? For the winter swimmers, Greece is a paradise. And while many people have long forgotten their swimming trunks and bikinis, swimming season never ends for many people. For the daredevils out there, the Athens Riviera has plenty of beaches to offer, but for the more skittish, head to Lake Vouliagmeni. With the lowest temperature recorded in winter being 22 degrees Celsius (72 degrees Fahrenheit), the brackish waters offer a natural experience of a thermal spa. The Greek Christmas holidays last 12 days; from Christmas Eve until January 6th, Greece celebrates Epiphany. But in some areas, it doesn’t stop there. 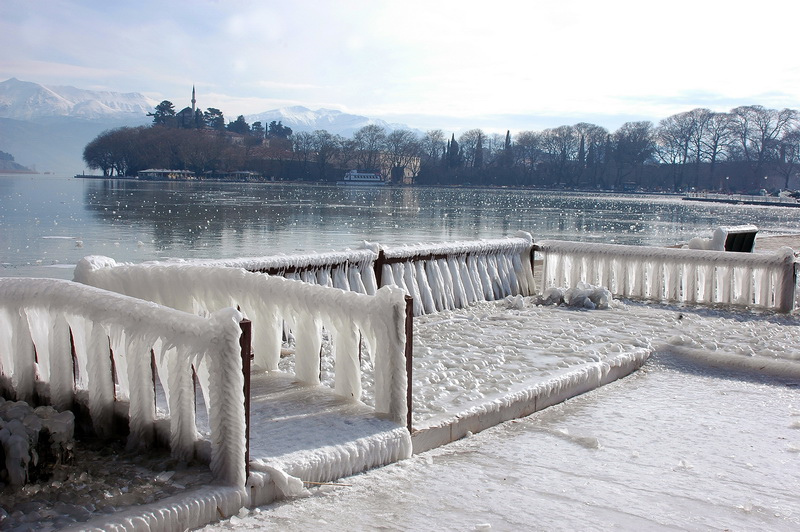 Take Kastoria, for example, where the local festival Ragoutsaria starts on the day of the Epiphany. This three-day festival, inspired by the Dionysian rituals, sees locals dressed up in costumes and dancing in the streets. The celebrations culminate on the 8th when the crowds gather on Doltso Square to battle in a sing-off. The day ends with parties and celebrations throughout the city. 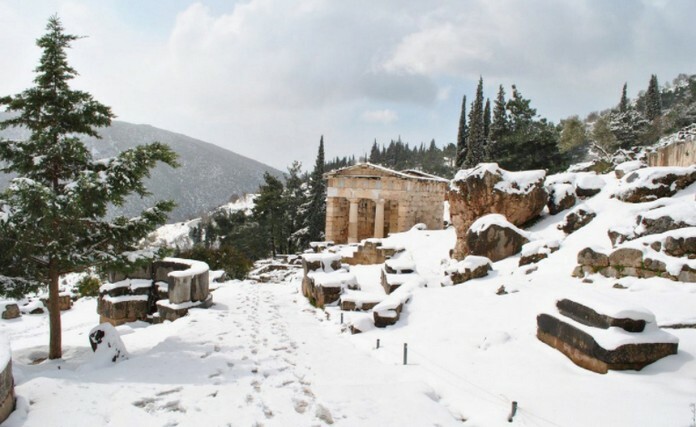 If all you know of Greece is stunning beaches, sunny days, ancient landmarks, and Greek islands, winter is an excellent opportunity to discover even more. The country is home to major ski and snowboard centers, such as Arachova, or Kalavryta, in Peloponnese. But if the mountain of the gods is what you’re looking for, choose the Elatochori Ski Center, in the Pieria Mountains, on the northern slopes of Mount Olympus. Perched at an altitude of 1,450 meters, the center has six ski trails stretching over ten kilometers, complete with a track for snowboarding. Come wintertime, the islands return to their true self. Locals settle back into their habits, and the moody skies add a touch of stunning drama to every scene. Unless you are into very quiet, even deserted, locations, stick to the bigger islands such as Crete, Corfu, or Evia where you can still have a complete experience during the colder months.